There are multiple reasons as to why you would need to apply aluminium surface treatments to your extrusions, all of which should be considered in the design phase of your profile. Understanding the end use of your profile and what treatment it will require is an important factor to your profiles success. Anodising aluminium is an electro-chemical process that provides a stronger, corrosion resistant surface and preserves a ‘Good as new’ appearance. The electrolytic anodising process produces a protective oxide film around the aluminium that doesn’t flake off or peel away. The most common form of anodised aluminium is translucent, but you can achieve a variety of colours through different anodising processes. Also known as ‘Bright Dipping’, bright anodising is a pre-process used to brighten aluminium prior to it being anodised. This pre-treatment enhances the aluminium’s reflective and shiny appearance but does not remove any scratches or lines on the alloy. Bright anodising is a chemical treatment which produces an extremely high sheen on aluminium which makes it a perfect finish for where a bright surface is required. Coloured surfaces can be produced on your part by inserting pigments of dye into the pores that form across your profile during the anodising process. This results in the aluminium being anodised in colour. There are a wide variety of colours your part can be anodised in from light to dark and applied to a number of surfaces from matte to brushed, etc. Understanding whether your part is going to be exposed to UV and whether it needs UV resistance is something which should also be considered before selecting your surface finish. Also, the colour appearance will vary depending on your selected alloy. Hard anodising is carried out using the same method as regular anodising using sulphuric acid but at a lower temperature. Typically applied to parts which are going to undergo a lot of stress and need a higher wear, corrosion and electrical resistance. It’s crucial that the right alloy is selected when choosing this surface treatment. Hard anodised coatings usually add a layer of thickness between 30 – 75 microns depending on the end use of your application. 100 microns can be achieved but doesn’t necessarily mean that it will improve the functionality performance of the hard-anodised coating. Mechanical finishing produces a wide variety of cosmetic finishes and textures such as a patterned matte look, or a classic mirror shine finish. Many methods are used to achieve these finishes such as buffering, brushing, bead blasting, grinding, tumbling and embossing. Embossing aluminium allows you to add patterns to your profile. It involves a tool pressing down onto the aluminium that creates a type of relief. This method of mechanical surface finish can improve the surface quality by adding a decorative finish and enhance the appearance of aluminium. The treatment leaves fine grooves in the direction of grinding. Surface textures can be made, very fine, medium or coarse. Appearance can be preserved by anodising the ground surface. Depending on the requirement you need, polishing aluminium extrusions is achieved by smoothing the surface of the aluminium. After the surface has been polished, it is usually bright anodised which gives the profile a high gloss finish. A finishing operation that deburrs, removes scratches and residues of aluminium. It also removes rust, cleans the aluminium and prepares parts for further finishing. This process is accomplished by a large barrel being filled with parts which is then rotated and tumbled giving a matte to bright finish. 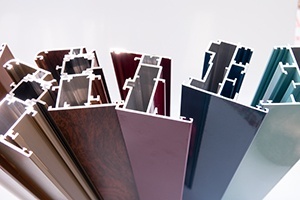 Not only does painting offer corrosion resistance, there are many colours and methods available to paint your part, the most commonly used is powder coating to paint aluminium profiles. Using this method, colours are virtually limitless. The difference between liquid painting and powder coating is that powder coating doesn’t require a solvent to keep the binder and filler parts in a liquid suspension form. Powder coating is used to give a harder finish and allows you to change the appearance of your profile to a glossy, metallic, clear or textured finish. Powder coating is less prone to chipping, scratching and marking. It is also less likely to run or blister and it can withstand knocks and certain types of abrasions compared to wet paint coatings. This method of surface treatment allows you produce end products with a finish which mimics the appearance of wood and other patterns or finishes. 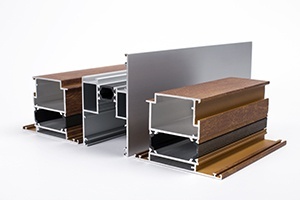 For example, aluminium profiles are often wrapped in a thin sheet of wood veneer to give the effect of a wooden finish. There are other methods of profile wrapping such as foils and laminates. Also known as ‘Silk Screen Printing’, Screen printing is an old method which allows you to mark your aluminium profile with both text and graphics. Commonly used on display panels, metal rulers, etc. 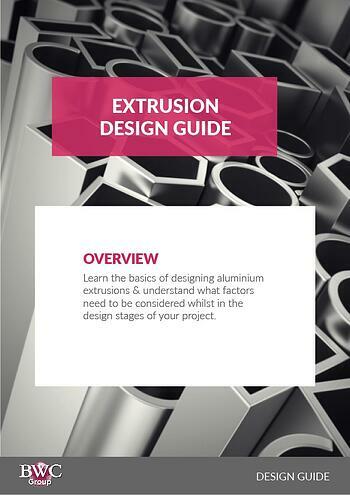 Check out our Aluminium Academy to learn more about designing extrusions, joining profiles, calculating the weight of your aluminium extrusion, anodising & more. If you require further information about what finish you should choose for your part, contact us today and we will be happy to assist you with your project.